Somewhere Between: Quietly Cancelled by ABC? Season Two? It looks like the Somewhere Between TV show has been quietly cancelled after one season on ABC. The network has removed the summer mystery drama, which premiered on July 24th, from the Disney-ABC press site. If Somewhere Between is cancelled, this means the September 19th season one finale episode, “One Must Die,” is also the de facto Somewhere Between TV series finale. Check out an episode description for it, below. An ABC television adaptation of the Korean mystery series, God’s Gift: 14 Days, Somewhere Between stars Paula Patton, Aria Birch, Devon Sawa, Catherine Barroll, JR Bourne, Samantha Ferris, Noel Johansen, Imogen Tear, Carmel Amit, Daniel Bacon, Rebecca Staab, Greyston Holt, and Matt Visser. The drama centers on news producer, Laura Price (Patton). When her daughter Serena (Birch) is murdered, the fates present Laura with a one-time-only “Groundhog Day” reset. If she saves the victims and catches the killer, she can change everything. The first season of Somewhere Between averaged a 0.36 rating in the 18-49 demographic and 1.80 million viewers. Its demo ratings and total viewership were lower than all of the other summertime ABC TV shows we tracked, except Still Star-Crossed, which has already been cancelled by the network. “One Must Die” – As Laura and Nico discover the reason for the vast conspiracy, they might be too late to stop fate from fulfilling its promise, as they race against the clock to try saving Serena – and Danny. The season finale of “Somewhere Between,” “One Must Die,” will air on TUESDAY, SEPTEMBER 19 (10:00-11:00 p.m. EDT), on ABC. “Somewhere Between” stars Paula Patton as Laura Price, Devon Sawa as Nico Jackson, JR Bourne as Tom Price and Aria Birch as Serena Price. Guest cast: Catherine Barroll as Grace Jackson, Noel Johansen as Danny Jackson, Samantha Ferris as Capt. Sarneau, Michael St. John Smith as Governor DeKizer and Rebecca Staab as Colleen DeKizer. 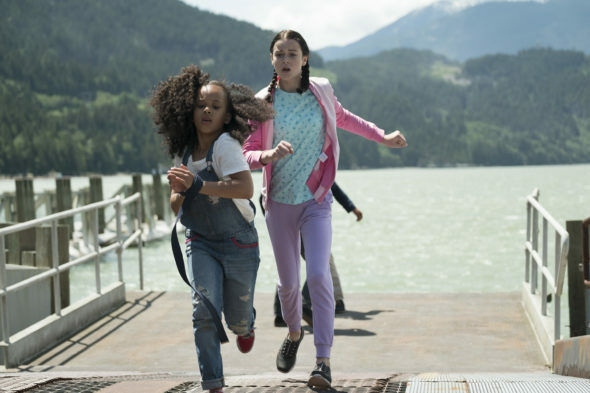 The series is produced by Thunderbird Entertainment in association with ITV Studios America, with ITV Studios Global Entertainment handling international distribution. Based on a Korean format from SBS, the executive producers are Stephen Tolkin (“Brothers & Sisters”), Ivan Fecan, Joseph Broido, Tim Gamble and Matthew O’Connor. “One Must Die” was written by Stephen Tolkin and directed by David Frazee. What do you think? Did you watch the Somewhere Between TV series? Should it have been cancelled or renewed for season two on ABC? You guys just renew it pleaaaaaaseeeee. It’s the best ever. Just found this show on Netflix, it had me hooked within the first fifteen minutes i absolutely loved it, i am so disappointed it has been cut. LOVEEEEEDDDD THIS SHOW , please bring back a second season , best show I’ve watched in a long time .